Mystic Falls 1864, finds Katherine playing the damsel in distress to a unsuspecting carriage passing by. Seeing a man lying in the road and thinking he needs help, the coach stops. Katherine immediately grabs the gentleman from the coach and begins to feed on him. Damon, who was playing the injured man on the road watches on. Walking up to Damon, Katherine tells him that it is that easy to find prey. Wanting Damon to have a taste of the fresh blood on her lips, Katherine begins to kiss him. Waking up the next morning in Stefan’s arms seems like sheer pleasure to Elena at least until Damon enters the room. He seems happy to break up their little bit of cuddling. He announces that it was time for them all to start to work together and find Jonathan Gilbert’s journal. In the journal is the whereabouts to the grimoire, Emily’s spell book. Flashing back again, Katherine is in bed with Damon and he tries to persuade her to turn him into a Vampire. Emily walks in on them before Katherine has a chance to bite Damon to announce that Pearl, Katherine’s close friend has arrived. Pearl is also a Vampire. Giving in, Katherine leaves Damon and goes down to meet with Pearl and her daughter Anna. Pearl is there to once again ask Katherine to leave the Salvatore’s alone and for them all to leave Mystic Falls. Pearl discovered that verbena was now being offered at the local market and that soon, they will be discovered. Katherine doesn’t take the warning seriously and continues on with her decision to stay. Present day, Mystic Falls, Anna is still trying to contact Jeremy and retrieve the journal. In the motel she shares with Ben, Anna hands him a bottle of blood. Not liking the taste, Ben asks when they can hunt again because he wants “fresh” blood. Demanding that he stay focused, Anna tells him to just worry about getting on Bonnie’s good side so they can use her to do Emily’s spell. Digging through old boxes of family heirlooms, Elena does not see the journal. Her and Stefan are both there trying to find it. Elena does come across a certain contraption that looks like a device to keep a person’s mouth shut. Before she has a chance to study it more, Jeremy enters the room. Asking her what she was doing, he soon discovers that she is looking for the journal. He tells her and Stefan that he lent it to his teacher Alaric Saltzman. He also tells him that Anna wanted it too. At the school copy machine, Alaric finishes up making copies of the pages from the journal. Locking them away, he goes to his desk to finish up some grading and places the journal next to him. Alaric becomes alert when he hears someone. Anna was there lurking in the dark hallways. Alaric gets his hand made cross bow for protection. When he finally shoots, he sees that it is Stefan and he is holding the arrow. Sitting him down, Stefan calmly talks to Alaric about the journal and what he wants with it. Alaric explains to him that his wife Isabel was into researching paranormal events in Mystic Falls. He also tells him that he saw Isabel in Damon’s arms and he appeared to be draining her of all her blood. Alaric never saw his wife or found her body ever again. 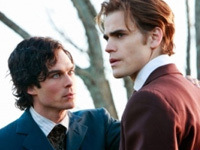 Stefan tells him to never let Damon find out what he is doing in Mystic Falls. He knows Damon will kill Alaric without even a second thought. Asking for the journal, Stefan and Alaric are shocked to see it had disappeared. At the motel, Anna tries to understand the journal and find out where the grimoire is. Feeling like she is getting nowhere, Anna does come across a passage about how Giuseppe Salvatore and the other leaders of the town were trying to capture the Vampires. Stefan and Damon’s father Giuseppe planned on capturing all the Vampires and locking them up in the church tomb. At the Gilbert kitchen, Damon is being quite the charmer and cooking up a meal for a “family” dinner. Jenna seemed quite taken with him and was enjoying a few glasses of wine while she watched on. Elena walks in and knows right away what he was doing. Jenna finally leaves and Damon confronts Elena about if he should truly trust Stefan. Nervously, Elena tells him that he can. Stefan shows up and tells Damon that someone had already taken the journal from Alaric. Remembering that Jeremy had mentioned Anna asked about the journal too, Damon sets out to questioned Jeremy about her. Jeremy lets them know that he is supposed to meet her later at the Mystic Grill. Damon decides to go along too. Once at the Mystic Grill, Damon is shocked to see that Anna is also the same Anna from his past with Katherine. Ben and Bonnie seemed to be enjoying their date together but Bonnie decides to talk to Elena real fast. After a brief few words of encouragement from Elena, Bonnie decides to go back out there to Ben and give him a big kiss. Suddenly, during the kiss, Bonnie gets a strange vibe and knows what he truly is. Recovering fast, she talks Ben into staying there longer but that she needs to use the ladies room. Approaching the bathroom, Bonnie is suddenly grabbed by Ben and take away. Once Damon leaves with Jeremy, Stefan and Elena read the copied journal that Alaric had made. After some reading, Stefan realizes that his father had the spell book buried with him. Soon, they both head off to the graveyard to dig up his father’s grave. In the process, Stefan flashes back to when he was with Katherine alone in his room. Katherine bends down to bite Stefan but upon drinking some of his blood, Katherine recoils and falls to the ground in pain. His father bursts in and tells him that he had put verbena in his drinks. This way he could catch Katherine and take her away. Calling for help, Giuseppe controls Katherine by putting a mouth piece over her mouth to stop her from biting anyone. Damon confronts Anna at the motel. He now knows who she is and what she wants. He asks her why their paths hadn’t crossed sooner. Anna tells him that she gets others to do her dirty work. Like Logan Fell who Damon is still ticked off with for shooting him. Of course there’s not much he can do since Logan is dead. Anna tells him that the journal didn’t tell her anything. Damon snatches up the journal and tells her that he works alone. Digging up his father’s grave, Stefan is relieved to finally locate the coffin. Opening up the lid, he pulls out the grimoire. Pulling it out, Damon slowly begins to open it. Within moments, Damon is there too and he’s quite upset that Stefan and Elena played him for a fool and that he actually trusted them. Demanding that Stefan hand over the book but getting nowhere. Damon threatens to rip out Elena’s heart if he doesn’t hand it over. Not believing him, Stefan still refuses. Showing that he means business, Damon races over and grabs Elena. Biting open his wrist, he forces Elena to drink from him. Soon Stefan agrees to exchange the spell book for Elena. Recalling the past once again, Stefan’s remembers when Katherine was captured. Damon had blamed him because he gave his father cause to doubt Katherine. Seeing Katherine captured, Pearl tells Anna to get Emily. Reaching for a horse to escape on, Pearl runs into Jonathan Gilbert. After a few words, he notices that the special watch he is holding is now pointing to Pearl. He alerts the crowd and they capture her to. Pearl pleads with him while Emily and Pearl look on in secret. Emily reassures Anna and tells her that she has a plan and not to worry about Katherine or her mother.